Bollywood actor Shahid Kapoor just addressed the rumors of Mira Kapoor’s pregnancy and the news is true. Hold your breathe, Shahid Kapoor have shared the news of second baby with the help of his 2-year-old daughter Misha Kapoor in a cutest way. Earlier this week, internet was buzzing with rumours of Mira Kapoor being pregnant, but there was no confirmation from the couple. 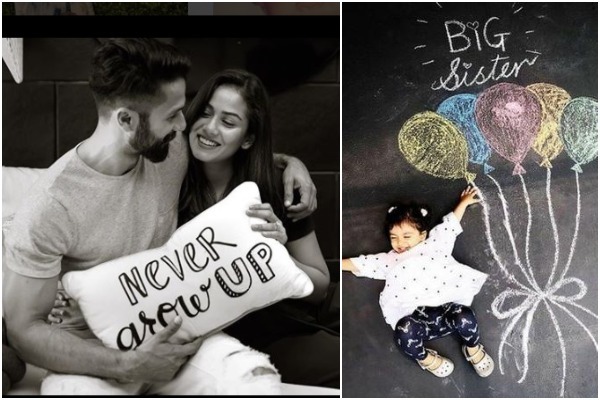 The news about Shahid Kapoor and Mira Kapoor expecting baby no 2 is just confirmed and their 2-year old daughter have adorably helped their parents to announce that she is going to-be “Big Sister” now. Shahid Kapoor and Mira Kapoor married in 2015. The couple have an adorable daughter who will turn two in August. Next : SEE PICS: Milind Soman and Ankita Konwar Are Now Married!